For those of you who haven't heard of us, we represent a local arts advocacy organization called Culture Initiative (CI). CI was started over a year ago to establish a valuable and accessible art community in Charlotte, NC, in order to inspire artists and supply a necessary platform for them to showcase their work. Since our inception we have hosted a wide range of arts & music events around the city, working with over hundred local visual artists. Our most dynamic event is in the works. 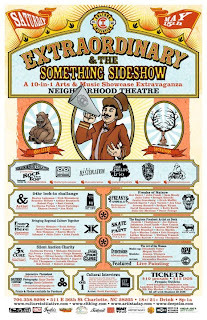 It is to be held at the Neighborhood Theatre in NODA on May 15th 2010 with about 60 of the best visual artists we have worked with along with several bands and performing acts. 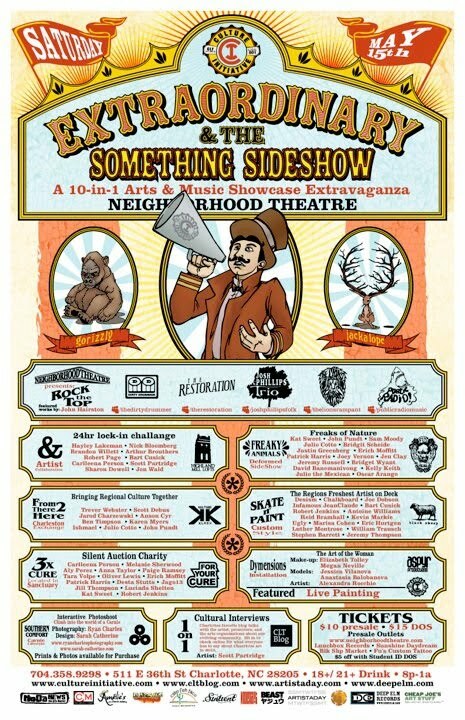 The event is titled The Extraordinary & the Something Sideshow: a 10-in-1 arts & music showcase extravaganza, will boast 10 exciting exhibits the likes the NODA community has never experienced. We are also very proud to announce that this event is part of the 10 day long Southern Holiday Festival, were several arts organizations in and around the city will be hosting Arts events to celebrate culture in our great city. We proudly welcome our Southern Affiliate to Charlotte, along with a group of their prominent Festival Artist. Paying tribute to Freak Show Deformed Animals of old. Bringing art to the skate deck. Interactive photoshoot that allows you to step into the living room of a Carnie, and take home a memento your Grandchildren will want to know WTF. a Q&A session with artist, venue, and staff about the Charlotte Arts scene and how things are changing for the better. A group of our fave Artist will be paint live to give insight on how they approach the canvas. A few from the archives..